Investing in door hangers is an effective and necessary step for any company or organization. Printing and designing door hangers can be an easy and inexpensive experience. So what is a door hanger? A door hanger is most commonly used to promote new and existing business’, or to promote a special offer or sale. Door hangers are often used by local/small businesses, restaurants, contractors and other types of organizations. When you choose Nu-Miracle Press for your designing and printing services, you are investing in a top quality product – from initial design to the final printing. Don’t waste your money on a boring door hanger that the customer will forget. Impress them with your first impression. 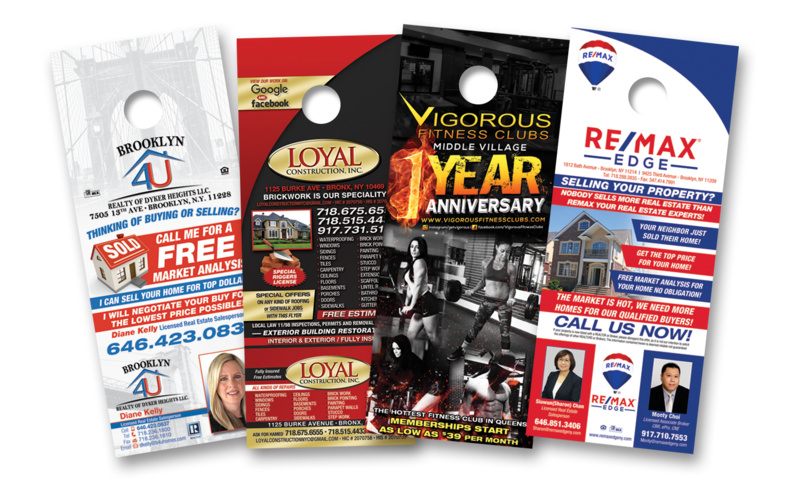 Our team of professionally trained graphic designers use innovative techniques and proven methods to create effective door hangers that make sales. We use large headlines, your brand colors, and call the customers attention to your special offer. For no additional cost, we offer a business card tear-off (if needed). to get started with your custom door hangers!